This familiar and much-loved annual grows from a height of six inches to about a foot and a half tall, depending on soil conditions and climate. It is among the first prairie wildflowers to appear in the spring. The state flower of Texas! Prefers hillsides and well drained areas. 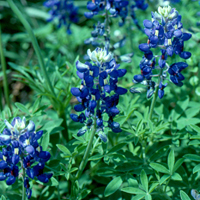 Bluebonnets are thought to have originated on the granitic soils of the Llano Uplift. 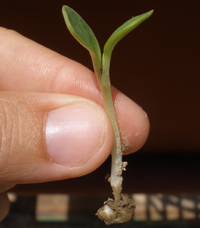 Because Texas Bluebonnet is an annual plant, next year's crop will only grow from previous years' seeds. Allow your wildflowers to fully mature and ripen their seeds before mowing. 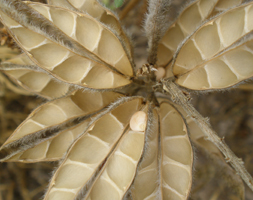 Photo shows empty seed pods of bluebonnets (above). Learn more about Bluebonnet Life Cycle. We also have Texas Bluebonnet Gift Packets available, which are perfect to give out at conferences, meetings, weddings, holiday gifts (July 4th thru fall is generally a good time to seed), and other events. Space is available on the front of these gift packets to print, stamp, or use avery labels to add your own message. If you are planning a presentation about Texas Bluebonnets or other natives, let us know about it! We've got some great native plant books that are free (they're outdated catalogs but have wonderful colored photos and descriptions). We ask you pay the shipping.